Several collectors new to the AGM site have been asking about how things work around here, which reminded me that the last time we had an article about that was 2009, and it's a bit outdated. No time like the present to remedy that. The AGM catalog operates a lot like the old Oklahoma Land Rush. First-come, first-serve. If you see it, you want it, and you press the button first, it's yours. * We do not sell anything from the catalog prior to opening time (3:00 pm US central time) on the announced day. This policy is known as our 'First Dibs Guarantee', and is explained in mind-numbing detail here, should you feel that more 'splainin' is required. * Register and make sure you can log in to your account well before opening time. This gives you plenty of time to sort out any issues with your password, etc. We do always get a few emails: "I know my password is correct, but it isn't working!" Normally it turns out that the user is inadvertently putting a space at the end of their password or email address, they have several email addresses and forgot which one they used on the AGM site, or any number of anomalies that we could not possibly diagnose in an accurate or timely manner without actually sitting in a chair next to them and observing first-hand while they work their keyboard. The solution to all of these ills is utilizing the "forgot password" link on the login page. Collect your new temporary password from your email, hunt it down in your spam folder if you didn't get the email within a moment or two, and off you go, problem solved. Easy to do with plenty of time for calm, logical thought. Not as easy for a passionate collector with seconds left on the catalog opening countdown clock. Right before opening time, we're also usually too busy putting out our own fires to walk people through the password recovery process. It's easy, though - just make sure everything is square ahead of time and you're golden. * Insider Subscribers have access to an online .pdf of the print catalog (text descriptions, no photos) starting at 9:00 am on opening day. First Dibs Guarantee still applies; they can't purchase anything (we don't even take phone calls before 3:00 pm). The advantage is that they can study and prioritize which items they will try to reserve once the catalog is open. This was introduced a few years ago after internet customers expressed concern that people with print catalog subscriptions had an advantage over them. Of course those who receive their Monday postal mail in the afternoon were also upset that some of their competitors receive theirs earlier in the morning, etc. This seemed like the best way to make it fair for everyone. IF for some reason there is ever a hiccup with the print preview Monday at 9:00, no worries - it has happened before, and we normally have it fixed in a few minutes. For more information on the Insider Preview, click here. 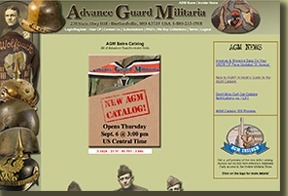 Can you successfully shop the AGM catalog without becoming an 'Insider'?? Absolutely. Only about 10% of our customers are Insider subscribers. Once the countdown reaches 0:00, the brown paper wrapper disappears, the catalog cover is revealed, and you can click on it to enter. Also, please do use the front entrance. Some customers have cleverly bookmarked obscure pages deep within the site in an attempt to be able to view items prior to the catalog opening. It doesn't work, then they get left in the dust when it actually does open. * 3:00:01, and the catalog is open! Now what? Assuming you took care of the registration, login, and personal account management stuff earlier, you enter the catalog to find this menu page. To speed browsing, the catalog is broken up into segments. For the first few days of a new catalog, ALL of the NEW STUFF is in the special category which is (very mysteriously) entitled "NEW LISTINGS". Everything else is in it's normal category: two US sections divided by time periods, Imperial German, Third Reich, two Other Nations sections divided by country, etc. There are also several specialized categories which are sometimes in use, and sometimes not, depending on the catalog contents. 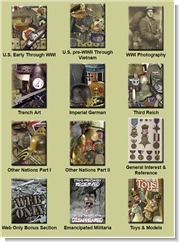 General Interest & Reference contains both published and new-old-stock reference books. Emancipated Militaria contains items that were reserved by customers who now apparently only exist as a photo on a milk carton. Oddly enough, right after we introduced this category, the need for it abruptly fell away, but there are still always a few gems to be found in there, and it makes me happy, so we kept it. After the opening rush of the catalog has died down a bit (normally 2-3 days), and depending on our schedule, at some point we eliminate the "New Listings" category, and everything is consolidated into their normal categories. Within each category, you can choose whether to browse via gallery pages with thumbnail photos of the items, or scroll through the item list. When you see an item that you wish to examine in more detail, click on it, and you are brought to the individual item page with the full description and photos. This page will also tell you if the item is still available, or has been sold. This is a real-time, live status, which can change right before your eyes if someone else buys the item while you are looking at it. (*Note: Depending on the browser you use, sometimes this availability status check makes the screen 'jump' when it updates every few seconds. In theory, the web guys tell me that this is fixed. However, browsers are constantly evolving, and it has been "fixed" before. Multiple times. If you encounter this phenomenon, often you can solve the problem by not holding pressure on your mouse's scroll wheel while browsing the item page or category listing.) If the item says "available" and you want it, click the "Buy Now" button. A pop-up window then appears, requiring you to confirm that yes, you really do want to buy this item and aren't just pushing buttons to see what they do. Please note - it is absolutely possible that between the time that you pressed "buy now" and "yes, I really want to buy it", someone else might complete the same process just a bit faster. When this happens, instead of seeing a congratulations message, you will see one indicating that the item has sold. This doesn't happen often, but when it does, it can be confusing... which reminds me, we really need to change that message to better explain what happened. The first hour or two of a catalog opening is normally when activity is heaviest, and thus when something like this is more likely to occur, though I have seen customers attempt to order the same item within seconds of one another even several days after a catalog first opens. Assuming that you successfully beat everybody to the punch on the ordering process, the site will send you an automated email letting you know that you have reserved the item, and advising you that invoices are posted at intervals during the first few days of a catalog, then once per day in the weeks that follow that. As you continue shopping (and hopefully buying each and every bit of militaria that strikes your fancy), we are receiving the orders on our end, and building the invoices. That evening, when things have calmed down a bit, we assign postage based on the combined total of the invoice. Those invoices are posted to the website under your account, and we send you an email letting you know that the site is updated, and your invoice is ready. If you wish to add more items (again, encouraged) - by all means do so, and we simply add them to your invoice, with the current version then available after the next website update. Continental US orders over $1000, shipping via UPS ground service have the benefit of FREE shipping. About 50% of the order confirmation emails seem to disappear into the ether of spam filters. This is why we built the online invoice and payment system. If you go to the site, click the USER CP link, and from there "View / Pay My Invoice". Even if you did not receive the email, you still have access to your invoice, information on when the site was last updated (so you can judge if this is your current invoice), and a link to the payment options. Trying to stay one step ahead of the NSA? Tech-challenged? If you don't want to register and use the online ordering system, that's not a problem. We still accept phone orders, and you can still browse the catalog online without registering. On the login page, the left side is to login as a registered user. The right side allows you to login and browse anonymously, as a guest. The downside is that you will need to call in and have us reserve items items manually on your behalf. Some of our customers think this is a shortcut, a way to get to the items faster. It is very much the opposite of that. But it does work, and if you need to do things that way, we're absolutely happy to help. Just call our order line 1-800-233-1918, listen to a bit of irreverent hold music, and eventually you will get to someone who will fix you up. Thanks for signing up - we really are happy to have you here!